A new series of coins dedicated to recall the "History of Navigation". These series reproduce a selection of boats that, for one reason or another, have been relevant over time. It consists of twenty coins. Four of them are put into circulation in 2018 and the remaining 16 in 2019. Special launching offer! 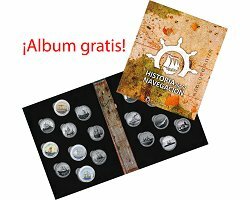 With the purchase of the first four coins (Phoenician Combat Ship, Drakkar Scandinavo, Spanish Navy and Juan Sebastian de Elcano School Ship), we will send you the collection book-case free of charge.